And so I did what I often do when I hear of a book that might interest me and marched into Bridgton Books in search of a copy. Alan was correct. It isn’t text heavy and indeed simplifies things in a way a dichotomous key cannot. Actually, this book includes so many of the nuances I like to share along the trail with folks who are looking at trees for the first or hundredth time and as I read it I felt like I was on a guided tour with a new friend. Mikolas begins this tree identification book by restricting the focus area to the Northeast–in a zone those of us who live in New England may find amusing for it ranges from our grand states south to West Virginia and west to Indiana and Michigan. As he explains, though, that’s the Northeast as defined by the World Geographical Scheme of Recording Plant Distributions. The book is divided into two sections–deciduous or broad-leaf trees and coniferous–or cone-bearing trees. And within each section, it’s broken down into individual trees with plenty of photographs to explain each characteristic. Mikolas keeps it simple and I wish I’d had this book when I first began my journey into familiarizing myself with different tree species. Similar to the approach taken by Donald W. Stokes in A Guide to Nature in Winter, who suggested learning six deciduous trees and the evergreens, Mikolas also encourages the reader to start with the most common, though he prefers the number twelve. I wondered what I might learn or relearn as I began reading. And found plenty of information, some of it already stored in my brain, and more to be tucked away. The book begins with red maple, which always has something red to display, but Mikolas also mentions the target fungus that affects only this species, creating a round bull’s eye on the bark. I know from experience that once your eye focuses on the target, you’ll begin to see if on so many maple trees. And as he said, and a forester told me several years ago, here in western Maine, 90% of our maples are Acer rubrum. That’s one thing you don’t have to worry about, except for one instance that I could find, he doesn’t use the Latin names. For some folks, that may be a downfall, but this is a beginner’s guide. I was pleased that he included the twisting of a sugar maple. Other trees twist as well and I can remember first realizing this while tramping with a friend. We couldn’t understand what was going on. The reason for the spiral growth is on page 26–you’ll have to read it for yourself. After describing these two trees, as he does periodically throughout the book, Mikolas gives clues on how to tell them apart. For these two, he describes their habitat, bark, twig and bud color. One of the clues he provides for beech trees is the fact that the leaves remain on the trees all winter. What I like about his comment is that he says this happens on young trees, for indeed, since I started paying attention, that’s what I’ve noted. He also described the habit of oaks retaining their leaves, but what he didn’t mention was the term to describe this habit: marcescence or withering. Maybe I was disappointed because I just like to say marcescence. When it came to ash trees, I was pleased that he described the bark as being diamond-shaped, but he added an X to the pattern and that may help when I next look at an ash tree with others. Some have a difficult time finding the diamonds. They don’t exactly glitter in the sunshine. I was thankful that when it came to the quaking and big-toothed aspen trees, Mikolas acknowledged that they are difficult to identify by bark alone. A few years ago, I spent some time practicing my tree ID with two different foresters and when I asked about these trees, they too, had a difficult time pinpointing the differences. Both were sure we were looking at quaking, but a quick scan of the ground below showed us big-tooth leaves. One thing I’d add to Mikolas’ description is that on the lower portion of older trees, the vertical lines are similar to that of a red oak. One of the really cool tricks I picked up from the book in reference to aspens is what he calls “birds on a wire.” Again, you’ll need to purchase a copy to find out what he means. Or join me for a tramp. I had the good fortune to meet one such character just the other day. In reference to basswood, Alan Seamans wrote in his e-mail message: “I didn’t know you could confirm i.d. of basswoood by the sound it makes when you hit it with a stick!” I didn’t either, but you can bet that’s on my list of things to do–frequently. Mikolas’ photo essay on the aging of paper birch bark from a teen to an old man is well worth a look. My only disagreement with him in this section is that what he sees as an inverted V over the branch, looks more like an inverted U to me, or as I’ve always described it–a fu manchu mustache of sorts. Likewise, Mikolas sees black triangles under the branches of gray birches. I could agree with him on that for when I say it’s a chevron, people don’t always get what I’m talking about. One friend, in keeping with the paper birch’s mustache, suggested the gray birch may have a beard–a gray beard. Mikolas also says that gray birches are chalkier than paper–experiment for yourself by rubbing your fingers on the bark and come to your own conclusion on that one. Turning to striped maples, I was tickled to learn a new common name. He used goosefoot, which describes the leaf shape, and moosewood because deer and moose like to leave their scent by rubbing their antlers on the bark, but a name I hadn’t heard before–whistle wood. Apparently, slip-bark whistles can be carved from striped maple or willow in the spring. I do wish I’d read this book before venturing to Central Park a few weeks ago. I was in awe of the American elms that grow there, and wondered about their health given that so many elms have succumbed to Dutch elm disease. What I didn’t realize is that what I saw before me was one of the largest and last stands of these majestic trees. Heading back into a woodland setting, and this one was actually in Vermont, occasionally we stumble upon red pine plantations. It was my understanding that these were planted by the CCC or Civilian Conservation Corps between 1938 and 1942 to provide farmers with a hill crop and others with employment. When walking in the woods and suddenly encountering a sterile environment where trees stand stalwart in lines and there is no undergrowth due to the thick needle cover below, and little diversity in wildlife, one may have entered such a plantation. At the time, it seemed like a good idea and provided work. In the forest, I often discover hemlock and balsam fir saplings sharing a space. One word of caution when it comes to differentiating between the hemlock shown here and balsam fir needles that are shown on page 188–both have two white stripes of stomata on the underside. There are other clues to help tell them apart and I’ve actually written about such in the upcoming issue of Lake Living magazine so you’ll have to stay tuned. And then there are the spruces and I have to admit, I have a difficult time with red versus white, though forester friends have said they hybridize. I noticed that Mikolas mentions both, but doesn’t provide the fine details about scent and twig hair. Perhaps it’s enough to know it’s a spruce–especially if it’s spikey to the touch. The tree descriptions conclude with the one and only deciduous conifer of our woods–the tamarack–the cone-bearing tree that loses its leaves (needles) each winter. And with that, I will conclude this rather lengthy review. I’m so glad Alan recommended it to me, for it really is a gem. I hope you’ll purchase a copy and together we can head out on the tree trail and get to know our local species even better. Put A BEGINNER’S GUIDE TO RECOGNIZING TREES OF THE NORTHEAST on your wish list and shop local. A BEGINNER’S GUIDE TO RECOGNIZING TREES OF THE NORTHEAST, by Mark Mikolas, published 2017, The Countryman Press. 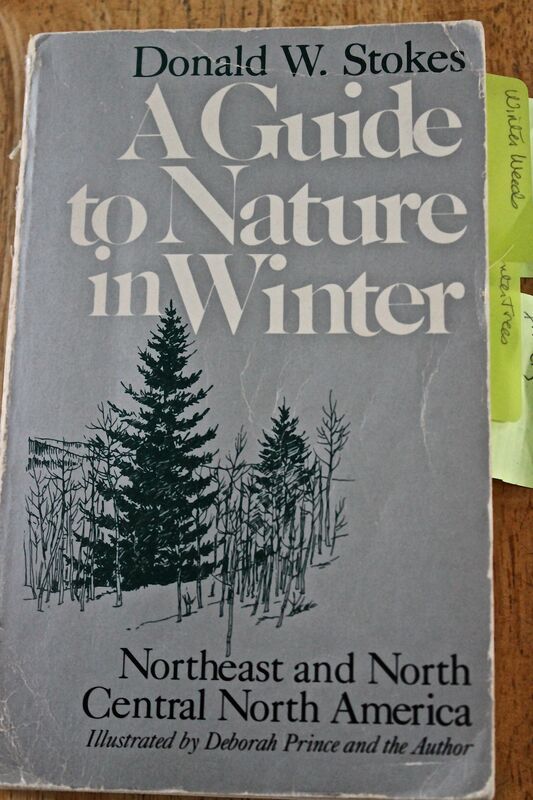 I have a number of winter nature books, but one of my go-to favs is A Guide to Nature in Winter by Donald W. Stokes. My copy is old (1976–it was a very good year–I graduated from high school) and a bit weathered, but that’s because it has seen frequent use. Divided into eight field guides, Stokes covers all aspects of winter: winter weeds; snow; wintering trees; evidence of insects; winter’s birds and abandoned nests; mushrooms in winter; tracks in the snow; and woodland evergreen plants. For each topic, pen-and-ink drawings by illustrator Deborah Prince and the author are included in the key, as well as natural history descriptions. The natural history descriptions are just that–Stokes’s descriptions are part of the story that Kevin Harding of the Greater Lovell Land Trust reminds us to share with others. Here’s an example: “St. Johnswort (Hypericum perforatum)–An old country custom in Europe was to hang a special yellow-blossomed plant in your window on the eve of St. John’s Day (June 24), in order to repel bad spirits and counteract the evil eye. In general, the presence of this plant was considered a good omen, and since it was thought that the plant warded off lightning and revealed the identity of passing witches, St. Johnswort was allowed to prosper around the farmhouse. It became known as St. John’s Plant or St. Johnswort (wort meaning “plant” or “herb”). When the plant immigrated to North America it left its traditions behind, and although still as effective as it probably ever was against evil, St. Johnswort is now seldom used for that purpose.” Of course, then he goes on to describe how the plant grows and the seed heads that will appear in the winter landscape. One of the things I’ve learned from this book is to keep it simple. In the chapter about winter trees, Stokes encourages the reader to begin with the six most common deciduous trees: oak; maple; ash; beech; birch; and aspen. Learning these along with the evergreens provides you with knowledge about 80% of the trees in your forest. I’ve spent the last couple of years developing my bark eyes. I still have much to learn, but can eliminate the common species when I encounter bark I’m uncertain about. It’s well worth taking the time to read A Guide to Nature in Winter from cover to cover–it’s an easy and enjoyable read. I say it won’t take long–unless you are like me and you pause to underline (yes, I mark my books up–even write in the margins, oh my!) details and take time to understand what you do see along the trail. I probably should invest in a more up-to-date copy, but I feel right at home engrossed in the one that I have. And it’s also easy to turn to a particular chapter to figure things out. The simplified, illustrated keys should bring you quickly to an identification. And as I said before, the natural history description will further enhance your learning. The book is available at Amazon.com, but if you live near an independent book store like Bridgton Books, then I strongly encourage you to shop there. A Guide to Nature in Winter: Northeast and North Central North America, by Donald W. Stokes, illustrated by Deborah Prince and the author, published 1976, Little, Brown & Company.